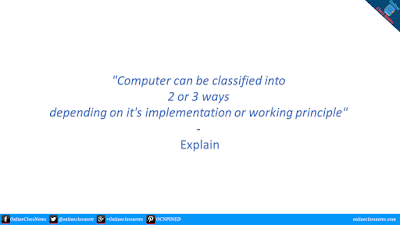 General purpose computers are computers where user is not limited to a set of initially installed programs and their function. Rather than this, user can install many other programs to perform various function depending on user's need. These computers come with expandable storage where user can store data for programs and also output. Typically these computers can have default programs which may or may not be uninstalled, but user can always install more programs. Everyday Personal Computers are general purpose computers. Special purpose computers are computers which are designed and built for performing one or a set of predefined function or operations. Users are not allowed to install new programs in it, but may update the existing programs. Analog computers are mechanical devices, weighing several tons and using motors and gears to represent data. Analog computers can change in its phase according to the analog signal and its input from pressure, temperature, vibration, spinning etc. Analog systems represent data as variable points along with a continuous spectrum of values. Example: Speedometer, operational amplify etc. Computers which uses digits and numerical calculations to process the data are digital computers. It breaks all types of information into tiny units and use numbers to represent those pieces of information. Digital computers also work in very strict sequences of steps. This type of computers output graphically using a various types of output devices such as monitors, printers, speakers etc. Those computer which has the both analog and digital systems in it are called hybrid computers. In this type of computers, data is taken into process through analog system and the output is represented in digital system.